We have recently learned of wonderful publishing successes by one of our recent alumni, and by a current doctoral student. 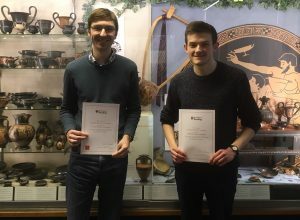 Charles Stewart, who completed his BA in Ancient History in summer 2018, has had an article accepted by the Journal of Roman Studies. The article is based on part of his undergraduate dissertation, which won one of the Department’s prizes for the best dissertation in 2017-18. Entitled ‘Fractional arithmetic in the Tabula Alimentaria of Veleia’, the article posits a new way of understanding practical arithmetic was conducted in the Roman world of the second century AD, and in so doing resolves an apparent anomaly that has long plagued scholarly reconstructions of Trajanic alimentary schemes. 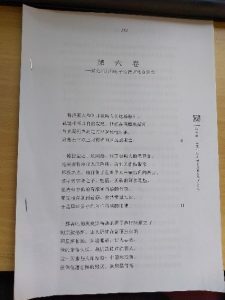 It will come out in the next issue of JRS, published in the autumn. Charles is now a Research Associate of the Department, and is considering postgraduate study. Rosie Mack is writing her PhD thesis on the depiction of horses on ancient Thessalian coins, under the supervision of Drs. 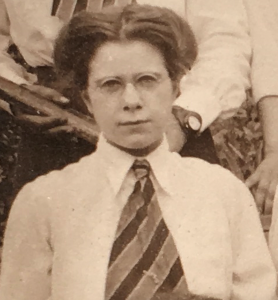 Emma Aston and Rachel Mairs. Her article, ‘Numismatic evidence (or not) for the aphippodroma horse race at Larisa’, has been accepted for publication in the numismatics journal Koinon. Like Charles’, it takes on a long-standing misunderstanding of ancient material, in this case a series of Larisaian coins which have traditionally been taken as evidence for a certain equestrian contest at a Thessalian festival. Rosie shows that, in fact, the coins depict an aspect of horse-training and so shed light on practical horsemanship in northern Greece as well as on the numismatic strategies of the polis of Larisa. We are delighted by these publishing successes of our students: many congratulations to both Charles and Rosie! 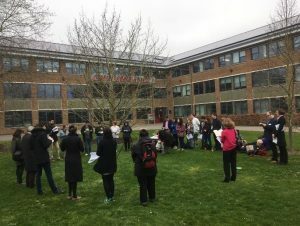 On Friday 22nd March 2019 the Classics Department led the University of Reading’s participation in the European Festival of Latin and Greek. This global event encourages academic communities to introduce and seduce public audiences with passage readings of ancient literary works. 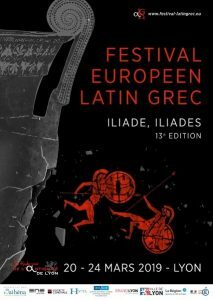 This year’s choice was Homer’s Iliad, an ancient Greek tale spanning many books of legendary battles, bravery and beloveds. After much thought, it was decided that Book Six would be suitably enticing and informative. In this Book Homer describes the honour and bereavement of war, detailing the pride of the soldier Hector and the grief of his wife. Book 6 provides detailed scenes of war, brotherhood and an importantly detailed portrayal of the ancient custom of guest-friendship. Book 6 also provides dialogues between lower ranking soldiers, such as the friends Glaucus and Sarpedon. 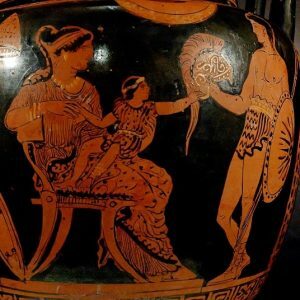 These Trojan allies give short conversational speeches to each other through which Homer highlights the complexities of military relationships, the compelling nature of heroism, and the grim reality of war. As the battle commences, low ranked soldiers are killed by higher ranking soldiers, who in turn are killed by the leading characters Hector and Achilles. The narrative provided by this wide range of characters, emotive circumstances and moral conflicts produces the epic battle, which is still remembered through Homer’s work in the present day. 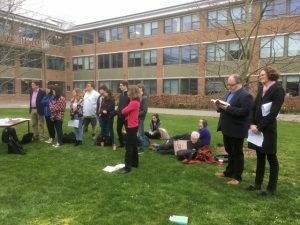 At 1pm, with Book 6 in hand, professors, undergraduates, postgraduates, curators and volunteers from the University and the town marched into the open air quad and surrounded on three sides by the Edith Morley building, they gathered on the green stage of this temporary theatre. PhD Researcher James Lloyd opened the event with a musical rendition of an ancient Greek song, thought to have been used thousands of years ago to begin such recitals. 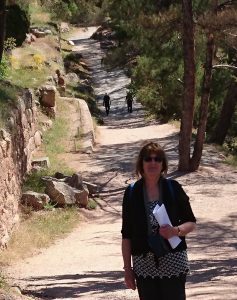 Subsequently, Head of Department Dr Emma Aston read, in ancient Greek, lines 1-11 recalling a fierce battle the led against the Trojans by Ajax. 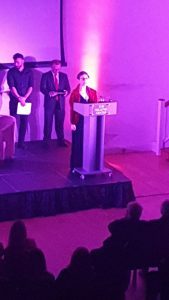 Each passage was then narrated by attendees who described the torment of Hector, Andromache and Paris in English, Italian, Chinese and German. The event was uplifting for all those taking part, with many onlookers stopping to observe. 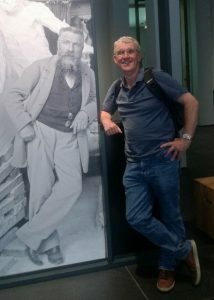 James Lloyd of Classics said: “the event was well attended and enjoyed by all. 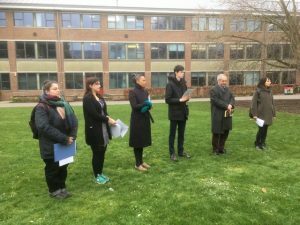 It was particularly good to hear the variety of different languages spoken during the reading, which is testimony to the thriving international community present in the Department of Classics”. The reading of Homer’s Iliad was a success and a credit to those who organised it. The event was short, precise and rekindled a passion for the storytellers of old whilst introducing the works to those unfamiliar with the tales. If you missed the event, fear not. The video of the recital is on YouTube and can be viewed here. Photo credits: James Lloyd, Amy Smith & Bunny Waring. 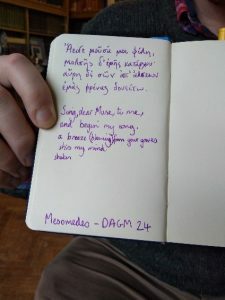 Did you miss the MOISA 2018 concert? 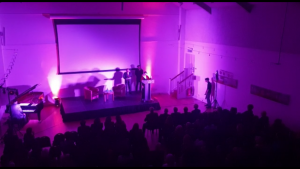 The videos of the stunning musical performances from the concert held during the 2018 MOISA conference (organised at the University of Reading by James Lloyd, Ian Rutherford and Donatella Restani) are now available on the Department of Classics’ YouTube channel. They represent the latest research into ancient musical performance and how Greek songs would have sounded. Here are the links. 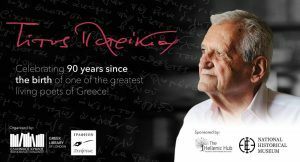 Next month (Friday 22nd March) the Department will take part in an international festival of Latin and Greek. 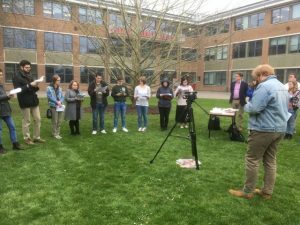 Students, staff and other colleagues will join people across the world in reading a book of the Iliad out loud in a public place. This way, we shall be experiencing the Iliad in the ways that ancient Greeks might have done, and we shall be sharing our love of classical poetry and culture with random passersby! Here is a link to the Festival homepage, and to a map of all the reading locations. My Ancient Greek is not up to much… Not to worry! The whole idea is to read in a variety of languages. Across the world, people are reading in Ancient Greek, but also in English, French, German, Afrikaans, Portuguese, Mandarin…you get the picture. I’m shy! We all are, but there is strength in numbers, and as the Greeks say, we learn through suffering – you never know, you might enjoy it. But the Iliad is boring…. 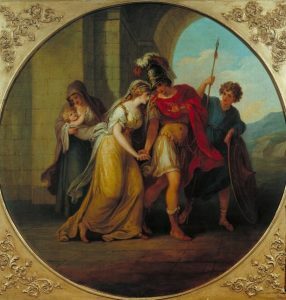 Bits of it might be, but we are going to read Book 6, where, a) Sarpedon and Glaucus debate heroism, and decide that the generations of men are like the leaves that fall, so why not leave a heroic legend behind, and b) Hector takes a poignant farewell of Andromache and their son Astyanax. Bring a hankie! OK I’m convinced. What do I do next? Good! 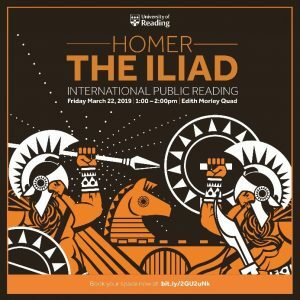 Please sign up here: Iliad reading sign-up form. 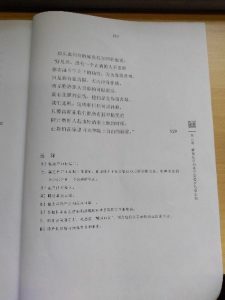 The more we are, the fewer lines we each have to read, so less chance of embarrassment! 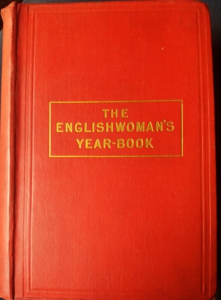 We read at 1-2 on Friday 22nd March, 2019, in the Edith Morley quad – more details will follow. For more information, please contact Barbara Goff, b.e.goff@reading.ac.uk.